Mount Athos is an autonomous monastic state in Greece. It covers an area of 330 sq kilometers and is protected as World Heritage under Unseco (http://whc.unesco.org/en/list/454). It is the third, eastern most leg of Halkidiki in Central Macedonia, Greece. 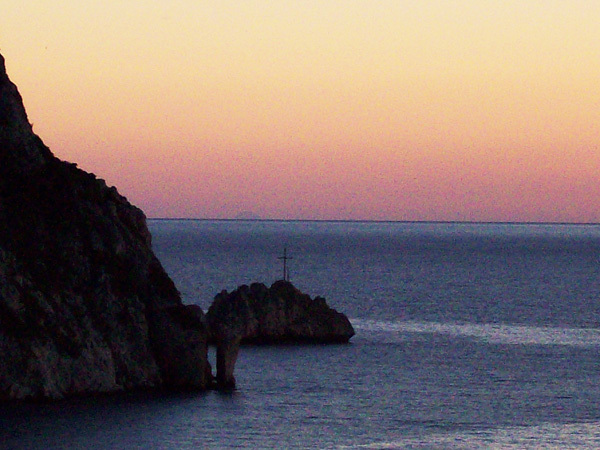 Mt Athos is commonly referred to as the "Holy Mountain" and its monastic presence dates back to at least 700 AD. Currently over 2,000 monks live on the Holy Mountain and they come from mostly Eastern Orthodox Christian countries. In the last century many have also come to live on the mountain from non-traditional Orthodox lands. It is one of the few places of worship on earth which is protected by political law and the largest Christian monastic center in the world based on the last census of 2011. 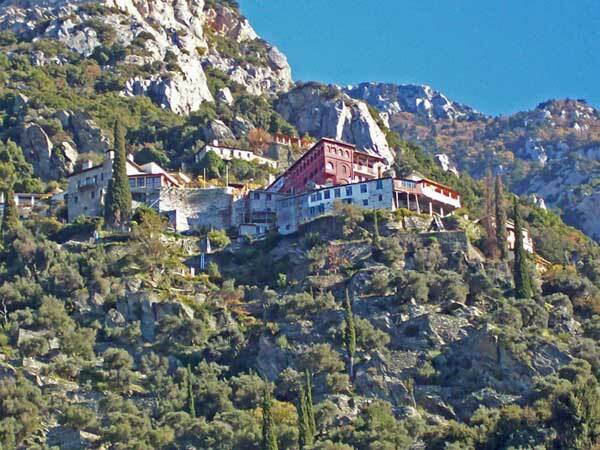 The hermitage of St Eleftherios Vouleftiria is one of the many hundreds of smaller retreats that, aside from the larger monasteries, exists on Mount Athos. 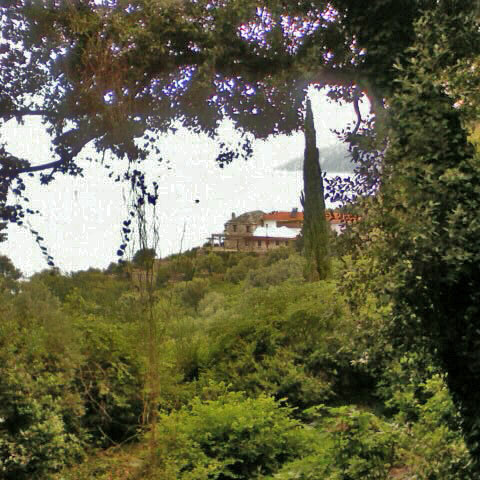 It is situated on the south-west side of Mt Athos, on a steep, lush slope at the foot of St Annes scete. Oral tradition dates the Hermitage of St Eleftherios - known in history as the monastery of Vouleftiria - to before 900 AD. The first formal written note of its existence is on the first official charter governing the organisation and administration of the Athonite state - or, typicon - of Mt Athos called "The Tragos". Tragos, Greek for billy-goat, was so called as it was written on a parchment of goat skin. The Tragos was publised in 972 AD and was signed by the then reigning Roman Emperor John Tzimiscis. On the parchment with the many other abbots names of the time is written the name of the abbot of the Vouleftiria monastery - monk Athanasios. It is also mentioned in the life of the founding father St Athanasios of the Great Lavra 960 AD. The Monastery of Vouleftiria was deserted due to the many raids of Catalan pirates during the 13th and 14th centuries AD. The last official abbot of the Monastery, Saint Gerondios, left with the remaining fathers and moved eastward toward the mountain settling a little above the Vouleftiria monastery. This new dwelling later became known as Saint Annes scete due to the presence of part of the 2,100 year old incorrupt relics of Saint Anne (the mother of the Theotokos) and the countless miracles to childless couples. St Annes is the largest and oldest scete on Mt Athos. The Hermitage of St Elelftherios - Vouleftiria was rebuilt in the early 18th Century and was officially named St Eleftherios after the church's consecration. The chuch is built on the ancient monastery of Vouleftiria foundations and is dated 1769. The rest of the building complex is dated from the early and late 20th century. Both the Church and older building complex are in need of repair. St Eleftherios Hermitage has 3 saints which are officially recognised by the Eastern Orthodox church. St Gerondios the last Abbot of the ancient Vouleftiria monastery and first settler of St Annes scete. St Nyphon of Kavsokalivia, a contempory and ascetic to St Gerondios that lived in the region of Vouleftiria, and St Paul a New Martyr who become a monk at the St Eleftherios hermitage and later martyred for his Christian faith under the Turkish occupation. Today it is one of the many Hermitages / Cells in the area of St Annes scete that are dependancies of the monastery of the Great Lavra. It continues the age old tradition of incense making for which the scete has become renowned.